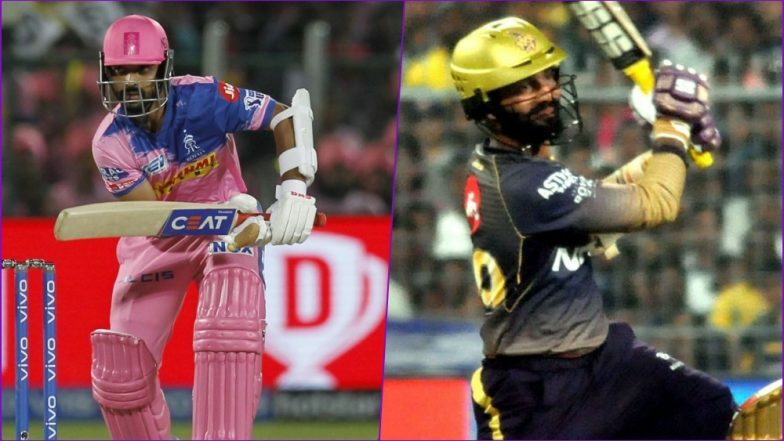 RR vs KKR Head-to-Head Record: Ahead of IPL 2019 Clash, Here Are Match Results of Last 5 Rajasthan Royals vs Kolkata Knight Riders Encounters! Both Rajasthan Royals (RR) and Kolkata Knight Riders (KKR) come into the VIVO Indian Premier League (IPL) 2019 match 21 on the back of a win against Royal Challengers Bangalore – tournament’s whipping boys. Andre Russell’s heroics changed the fortunes of Kolkata against Bangalore as they snatched victory from the jaws of defeat. They will certainly be pumped with the manner of victory and against an opposition that has a single victory so far, it could play a major role. Overall in the head-to-head record, Rajasthan and Kolkata have met 19 times and there is no separating the sides in terms of wins- both have 9 wins to their credit while 1 game produced no results. Looking back at the last five encounters between RR and RCB. Last year, Rajasthan were making a comeback in the Indian Premier League after a gap of two years and they did well to reach the Eliminator where they met Kolkata. KKR batting first put on 169/7 which is a significant score in a knockout game. Rajasthan chase began well with Ajinkya Rahane making 46 and Sanju Samson hitting a fifty. But once these two departed, RR lost the way of losing the game by 25 runs. Spinner Kuldeep Yadav picked up four wickets and was supported by pacers Andre Russell and P Krishna who bagged brace each to stop Rajasthan at 142. Kolkata made 145/4 in 18 overs to script an easy win in front thousands of cheering fans. Andre Russell and Dinesh Karthik both remained present till the end to see off Rajasthan. Darcy Short and Ajinkya Rahane batted well in the top order for Rajasthan but a frugal contribution from the rest of the pack restricted the hosts to 160/8 where they could have easily made above 180. Kolkata batsmen were in the mood to punish Rajasthan for this fatal error as everyone part from Chris Lynn managed good runs to take Kolkata home. Heroics by centurion Shane Watson enabled Rajasthan to pile on 199/6 on a flat track at the Brabourne Stadium in Mumbai. But Kolkata were not giving up without a fight as Yusuf Pathan and Andre Russell showed great resilience. The KKR boys eventually ran out of steam and folded for 190/9 in their twenty overs. Rain played spoilsport as the game between Rajasthan and Kolkata in Eden Gardens had to be abandoned without a bowl being bowled. KKR will be too strong for RR despite them being away from home as the visitors have some really special talent that can change the game at any moment.